Pizzeria Mamma Mia is a well established Italian restaurant/pizzeria. 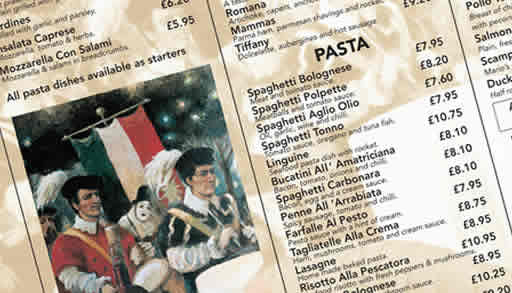 We incorporate an authentic Italian cuisine with a Sardinian twist, in a friendly, relaxed atmosphere. Always very good service at this restaurant anytime midweek week-ends food is cooked fresh anything from their menu is cooked especially for you, waiters are very friendly and add to the atmosphere of this charming restaurant, I cannot praise the food and how it is cooked and served enough you must try it, I highly recommend this restaurant. Visited here with my Mum.It was best pizza I’ve had for a long time, we used to come here over 10 years ago as a family it is just as good now as it was then.Service attentive and friendly with fantastic food great, we wont leave it so long next time. Pizza Caprichiosa to die for, and such cheerful friendly staff. Mamma Mia is one of my favourite restaurants. Not once have i had a bad meal here and we eat here most weeks. The food is always good, excellent when Mario is in the kitchen. I love the service and the fact that it is the owners son who is waiting on. It really feels like an Italian family restaurant experience. The wine is excellent, especially the Cannonau (which is hard to come by in other restaurants). All in all Mamma Mia’s is a wonderful experience and highly recommended. Mario’s steak cannot be surpassed!